Hip No. 426, a daughter of The Factor consigned by Wavertree Stables, Inc. (Ciaran Dunne), Agent, went to East Hickman Bloodstock for $180,000 to top the second session of the Ocala Breeders’ Sales Company’s 2018 June Sale of Two-Year-Olds and Horses of Racing Age. The gray or roan filly, who worked a quarter in :20 4/5 at Friday’s session of the Under Tack Show, is out of stakes winner America’s Friend, by Unusual Heat, a full sister to graded stakes placed stakes winner Bel Air Sizzle. Hip No. 486, a son of Macho Uno also consigned by Wavertree, was purchased by Good Friends Stable for $155,000. The gray or roan colt, who turned in an Under Tack eighth in :10 1/5 on Saturday, is out of Black Lace, by Afleet Alex, and is a three quarter brother to champion sprinter Private Zone. Hip No. 320, a son of Run Away and Hide consigned by Stephens Thoroughbreds LLC, Agent, was sold to George Mellon for $150,000. The bay colt, who breezed an eighth in :10 flat at Friday’s Under Tack session, is out of Texit, by Tapit, a half sister to graded stakes placed My Corinthian. Stetson Racing LLC paid $150,000 for Hip No. 457, Yesterday’s Girl, a chestnut filly by Mucho Macho Man who turned in a quarter in :20 4/5 on Saturday. Consigned by RiceHorse Stable (Brandon & Ali Rice), she’s out of stakes placed Ayers Hall, by Jade Hunter, from the family of champion Estrapade. Hip No. 401, a son of Uncaptured consigned by Hawks Nest LLC, was sold to Justin Casse, Agent, for $135,000. The chestnut colt, who breezed a quarter in :21 1/5 on Friday, is out of Yes It’s Valid, by Yes It’s True, a daughter of stakes winning OBS graduate Valid Forbes. Joe Sharp, Agent, went to $110,000 for Hip No. 332, a son of Dialed In consigned by de Meric Sales, Agent. The dark bay or brown colt, whose eighth on Friday in :9 4/5 was the sale’s co-fastest at the distance, is out of Top Trick, by Hat Trick (JPN), a daughter of graded stakes winner Blushing Heiress. Hip No. 348, a daughter of Tiznow consigned by Woodside Ranch, Agent, went to Rio Vista Stables – Janice Klein for $110,000. The dark bay or brown filly, out of stakes placed Unbound, by Distorted Humor, turned in an Under Tack eighth in :10 1/5 on Friday. Hip No. 369, a bay filly by Pioneerof the Nile consigned by Eisaman Equine, Agent, who also worked an eighth on Friday in :10 1/5, was purchased by Gayle Van Leer, Agent, for $110,000. She’s out of graded stakes winner Washington Bridge, by Yankee Gentleman, a daughter of stakes winner Stirling Bridge. Hip No. 534, Slewgoodtobetrue, a daughter of Jimmy Creed consigned by Mayberry Farm, Agent, went to Larry Zap, Agent for Joseph Ciaglia, Jr. for $110,000. The dark bay or brown filly, who breezed an eighth in :10 2/5 on Saturday, is out of Chiefette, by Chief Seattle, a daughter of stakes placed Daederbe. JSM Equine LLC paid $110,000 for Hip No. 540, a daughter of Violence consigned by Hoppel’s Horse & Cattle Co., Inc., Agent. The bay filly, out of Citron Lady, by Lemon Drop Kid, a half sister to stakes winner Izzy Speaking, turned in an Under Tack eighth in :21 1/5 on Saturday. 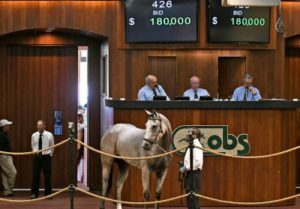 For the session, 152 horses sold for a total of $4,598,500, compared with 213 selling for a total of $7,739,900 at last year’s second session. The average was $30,253 compared with $36,338 a year ago, while the median price was $14,500, compared to $20,000 in 2017. The buyback percentage was 27.6%; it was 19.3% last year. The June Sale continues Friday at 10:00 a.m. Hip No.’s 601 – 936 will be offered. Friday’s session will again be streamed live via the OBS website at obssales.com and via the Blood-Horse, Daily Racing Form and TDN websites.